Our family of artists come from a long line of master glassblowers. Scott, a fourth generation glassblower, is the Grandson of John Cudequest and the son of John & Kathy Warner. He began his Apprenticeship at Santa's Workshop, a theme park at North Pole, New York in the Adirondack Mountains, in 1982. 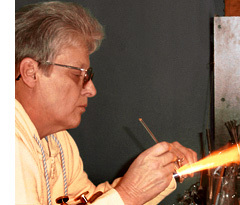 Scott continued his Journeyman ship at "The Crystal Palace" glassblowing shop in Opryland, USA in Nashville, Tennessee, where he worked until the park closed in 1997. He concluded his Masters training at our shop in Helen, Georgia which he operates to this day. He is now largely responsible for design and production of many beautiful hummingbirds, butterflies, dragons, swords and other specialties which we carry in all our stores. Scotts daughter, Lindsey, can often be seen, at the shop in Helen, working and learning the business just as her father did years ago, from the ground up. Please stop in anytime to see him work... and children are always welcome! 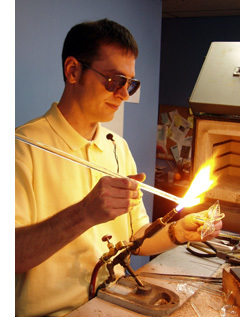 Chris Kennedy, a fourth generation glassblower, is the Grandson of John Cudequest and the son of John and Kathy Warner. He grew up in the mid-west spending much time at his parents glassblowing shop at Holiday World, Santa Claus, Indiana. He started his Glassblowing apprenticeship in 1997 in the historic town of Dahlonega, Georgia. What Chris enjoys most is combining "Dichroic Glass", which is flat, reflective and multi-colored with colored and crystal glass, to make unique, one-of-a-kind sculptures. He is largely responsible for handblown barometer swans, Christmas balls, one of a kind "Dichroic Glass" pendants, and "Names in Glass" which are sold at all of our shops. 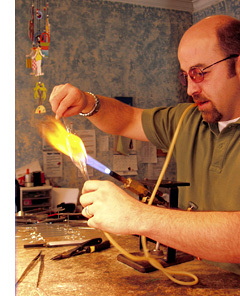 His wife Cheryl, an elementary school teacher, enjoys bringing her classes to the shop on field trips for a demonstration of the art of "Flamework" Glassblowing. JoAnn McCabe was trained by John Cudequest in the mid 1960’s. She completed her apprentice and journeyman levels and became a Master Glassblower in 1974. She is largely responsible for The Glassblowing Shop’s Christmas line and specializes in the blowing of hollow vessels. She can be seen working in the shops in Lake Placid, New York and at Santa’s Workshop - North Pole, New York. JoAnn is always happy to demonstrate her art to any guest that visits her shops. She is in the process of teaching her daughter Cora, the art of Flamework Glassblowing and is hopeful that her grandchildren will follow in her footsteps.